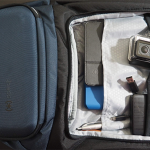 Disclosure: We received samples of the products highlighted in this post. All opinions are our own. 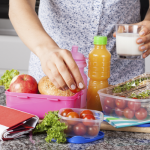 This back-to-school season, why not mix things up a bit by seeking out a variety of delicious snacks and foods that both kids and parents will love, rather than opting for the same-old same-old. No matter how rushed we feel in the mornings, starting the day off with a good breakfast can make all the difference in terms of our children’s class-time productivity. We love the new Kashi Cocoa Coconut with KAMUT® Khorasan Wheat Granola as a fuel for busy days. Enjoy this tasty, new granola as a snack or breakfast cereal, or pair it with blueberries and bananas like we did! The delicious cocoa flavor really comes through so kids will love it, while parents will appreciate its non-GMO Project Verified and USDA Certified Organic status. 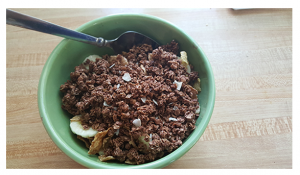 Kashi Cocoa Coconut with KAMUT® Khorasan Wheat Granola is available for $3.99 at retailers including Shoprite, Wegmans, Publix, Meijer, Ahold, HEB and Safeway. 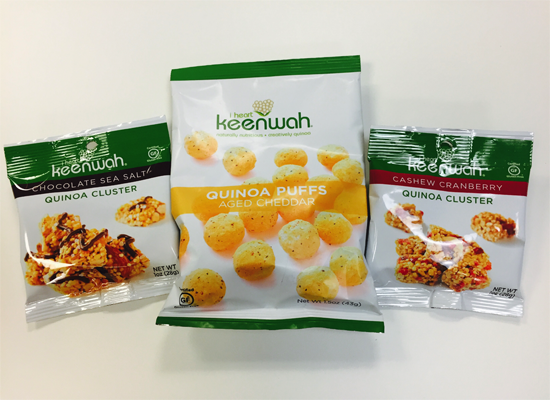 One of my favorite protein-pack snacks that both kids and adults will love is the i heart keenwah snack size Quinoa Puffs! These light, airy and portable snacks come in 1.5oz packages in two delicious flavors – Aged Cheddar and Herbes de Provence. The Herbes de Provence flavor is Vegan and Dairy Free, if you have either of these dietary restrictions. A healthier version of traditional cheese puffs, each 180-calorie pack contains 5g of protein. Created with a minimal number of simple ingredients, these all-natural quinoa puffs can be purchased for $1.99 online at iheartkeenwah.com and amazon.com and will be rolling out to more locations nationwide. The 3oz packages, available in an additional flavor– Sweet Chili – can also be purchased online, as well as at Wegmans, Heinens and The Fresh Market. I even spotted the Sweet Chili Puffs during my last checkout experience at T.J. Maxx! Also try i heart keenwah quinoa clusters – crunchy little bite-sized squares of goodness combine quinoa seeds, puffs, and flakes together with simple nuts and fruits. Available in 1oz packages in two tasty flavors – Chocolate Sea Salt and Cashew Cranberry, each pack is 130 calories and contains 3g of protein. Pick up these quinoa clusters for $1.99 online at iheartkeenwah.com and amazon.com. Kracklin’ KAMUT®, a new alternative to savory snacks like popcorn and peanuts, consists of large kernels of organic ancient grain KAMUT®, lightly salted with ancient salt from caves in Utah. It proves a nutritious alternative to peanuts, popcorn and other savory snacks that contains a snackload of fiber, protein and lipids! Kracklin’ KAMUT® is available in packs of 12 for $16 at kracklinkamut.com.